The use of the Svengali principle with playing cards has been extended to writing pads, and now, to envelopes. Sven Lee’s Svenlopes have added another dimension of deception to the Svengali force. You are also given more flexibility to force different objects, so long as they can be inserted into the envelopes. Sven Lee has also provided actual props for use with his Svenlopes in his superheroes and Hollywood movies effects. Svenlopes Yin & Yang is another routine in which the props are supplied. This is an effect that involves mysticism and mystic symbols. Two packets of small envelopes are displayed. One packet consists of black colour envelopes while the other packet comprises lighter colour envelopes. Inside each of the envelopes are different mystic symbols. Two spectators help out. One chooses one of the black envelopes and the other selects a light coloured envelope. Mysteriously, one person has chosen one half of the Yin & Yang symbol, while the other person selects the other half of the Yin & Yang symbol. When placed together, the two selections form the complete Yin & Yang symbol. The two spectators must be in sync with one another! The Yin & Yang symbol also matches the prediction placed inside an envelope earlier. In the second phase, the prediction card is turned over to show several different numbers. The numbers are printed in different colours. Each of them is also associated with a different shape. A spectator chooses either a shape or a colour and adds all the numbers found in the selected shape or colour. The total coincides with a prediction placed by the performer before the start of this phase. In the third phase, another spectator is given a mystic card that contains 15 words. She is told to read all the words to the audience. She turns the card over and it is seen that the 15 words are used to form a sentence. She then reads only the alternative words in that sentence. They form a phrase. Everyone in the audience googles that phrase with their mobile phones. The result is a number. Mysteriously, this number coincides with the total arrived at in phase two! This is a multi-phase prediction effect. You receive a packet of 20 black Svenlopes and another packet of 20 Svenlopes of a lighter colour, and 40 small mystic symbols, 20 of which are the force symbols. You also receive a separate prediction envelope and 2 prediction cards. The Svenlopes are precision laser cut and they are beautifully manufactured. To protect them, especially to prevent their corners from being crushed, you are supplied with a tempered-proof transparent box to contain and transport the 2 packets of Svenlopes. A 28-page pdf describing the Svenlopes product, the advantages of using Svenlopes, and various methods of handling the envelopes during a performance. 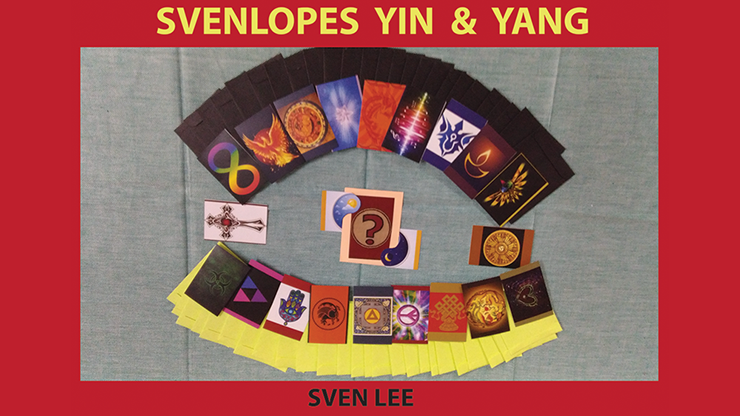 A 16-page pdf providing the full instructions for performing the Yin & Yang prediction effect. A 91-page pdf describing the Svengali principle and 22 routines using the Svenlopes.